Gear up for the 2018 FIFA World Cup taking place in Russia this summer. 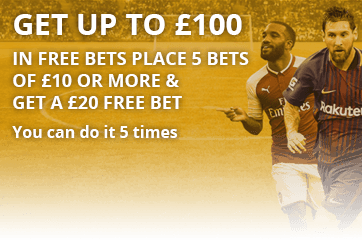 Great offers are waiting to get you whipped into optimum betting shape. Compare odds and offers from the UK's top bookies and start placing your bets. With a wide variety of betting offers available, backing your favourite team or player at the 2018 FIFA World Cup is set to be a thrilling experience. Find out more about enhanced odds, top goalscorer markets and massive accas that come with excellent acca insurance. If you’ve made up your mind and are ready to take a punt on the Three Lions to win the World Cup, you can place a bet straightaway. As the tournament progresses, odds will be constantly changing – in some cases, they can shorten dramatically right before a game! You are best advised to make the most of the odds offered by getting in early on the action. As it stands, several bookmakers have already been touting their favourite contenders for the World Cup crown: Brazil, Germany, France and Spain are all being heralded as potential winners. It always pays to shop around when placing a bet. Check out the odds offered by various bookies and odds comparison sites such as oddspedia.com before placing a bet. In a bid to attract punters, bookies are slashing their prices and competing to get as many customers as possible. Keep your eyes peeled for special offers and enhanced odds. Ever since the FIFA World Cup group draw on 1 December at Moscow’s Luzhniki Stadium, clear favourites have emerged in each of the groups. While the host country in Group A will be facing weak contenders in the form of Saudi Arabia and Egypt and a serious rival in Uruguay, joint-favourites Brazil and Germany will be playing against Switzerland and Sweden respectively. Having been relegated to second seeds according to FIFA’s October rankings, England will have to hold their own in Group G against Belgium, Panama and Tunisia. Group stage betting adds some extra fun to your betting experience. Punters can choose to bet on qualifying teams, group winners and even losers. Early favourites to win the 2018 FIFA World Cup include Brazil, Germany, France, Spain and Argentina. Compare odds across several bookies and place a bet on your personal favourite. Five-time World Cup winners Brazil are among the hottest tickets for the 2018 tournament. After accepting a crushing defeat against Germany at the 2014 World Cup, Brazil’s stakes are set high once again. With Philippe Coutinho and Thiago Silva, Brazil are armed with some top players, making them a force to be reckoned with. Ever since drubbing arch-rivals Brazil in the 2014 World Cup, defending champions Germany have been quoted as firm favourites. The German team appear to be in fine fettle since bringing key players Joshua Kimmich and Niklas Sule into the fold. With the 2018 FIFA World Cup being the biggest betting event of the year, bookmakers are getting in early with their offers. Check out the latest odds and offers for outright bets. Special markets are an exciting way to bet on your favourite player scoring the highest amount of goals in a game or tournament. With the cream of the football crop present in Russia, betting on a top goalscorer isn’t shaping up to be an easy task. While football heavyweights such as Lionel Messi, Neymar, Timo Werner and Cristiano Ronaldo are all top contenders, it’s often the lesser-known players who score the most goals. Punters will want to turn their attention to France’s Antoine Griezmann and Germany’s Thomas Mueller as viable alternatives. Make the most of your 2018 World Cup experience by betting on specials. Bookmakers offer punters a whole host of betting options that are both exciting and excellent value. 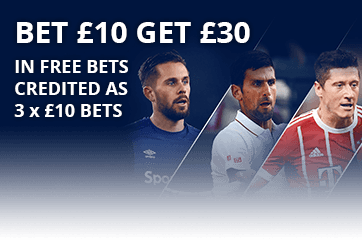 Betting specials can include player and team specials: have a punt on which team a World Cup player will join next and root for your favourite teams during the group stage. Some of the most popular betting options include correct score, halftime result, correct score and double chance. While typically offering lower odds, double chance bets are a great way of securing your win when betting. Predicting the score is a thrilling bet that provides suspense all the way. Of course you’ll want to take a punt on a team you hold close to your heart, but in order to maximise your winning chances, there are several things you should be doing. Don’t let yourself be swayed by extremely short odds – such matches can easily end in a draw with both teams’ abilities being closer than the odds account for. You should always check form guides and news reports so you know what you’re dealing with. Try identifying great value by backing the underdog where appropriate. Don’t forget to use the cash out feature to your advantage when betting online. Handicaps are another intriguing and fun way to go about your betting. In handicap betting, teams are assigned an advantage based on their form. This type of betting originated in Indonesia, only to experience a serious popularity surge in recent years. Depending on your stake and the type of Asian handicap you’re betting on, you could see yourself winning, no matter the outcome. Contrary to Asian handicapping, European handicapping allows draws to occur, meaning you’ll lose your bet if the match ends in a draw. Another popular option are the over/under markets available for both half time or full-time scores. If you place a bet on an ‘over’ option, you can cash out as soon as your team has scored the necessary amount of goals – a fact which makes this type of bet especially satisfying. Surebets offer an excellent way of boosting profits and ensuring you always win. In this type of betting, punters place a bet on each outcome with different bookmakers. Because the odds have been carefully calculated to offer a maximum advantage, punters always win regardless of the final outcome. While the win amounts are typically low, you’ll at least know you won’t be losing. Surebets are based on market discrepancies, but seeing that odds can fluctuate a lot, caution is advised. Typically, surebets are calculated using special software and offered by betting sites not affiliated with individual bookmakers. The one drawback of placing a surebet is that you would be risking a high stake for a very small profit.